HOW CAN THE EHR COSTS BE LOWERED AND THE BENEFITS IMPROVED? HOW CAN THE RISK OF ADOPTING THESE PRODUCTS BE LOWERED? ARE YOU ON TARGET FOR YOUR FIVE-YEAR TIMELINE? WHAT CAN THE AAN DO TO ENCOURAGE MEMBERS TO ADOPT EHR? David J, Brailer, MD, PhD, was appointed the first National Health Information Technology Coordinator in 2004 to implement an Executive Order of President George W. Bush: to facilitate widespread use of health information technology within 10 years to improve patient safety and efficiency. Dr. Brailer, who earned his medical degree at West Virginia University and his PhD in managerial economics at The Wharton School, is an expert in health information technology and health systems management. Prior to his appointment, Dr. Brailer was a Senior Fellow at the Health Technology Center in San Francisco, a nonprofit research and education organization that provides strategic information and resources to health care organizations about the future impact of technology in health care delivery. He also served for ten years as Chairman and CEO of CareScience, Inc., a leading provider of care management services and Internet-based solutions that help reduce medical errors and improve physician and hospital-based performance. Dr. Brailer delivers the Public Policy Lecture today at the Presidential Plenary Session today at 11 AM at Exhibit Hall D. In an interview with the Neurology Today Meeting Dispatch, he highlights the government's strategies for supporting electronic health records (EHRs). WHAT IS OUR GOVERNMENT DOING TO HELP PHYSICIANS IMPLEMENT EHR? The Certification Commission for Health Information Technology (HIT), a voluntary, private-sector initiative to certify HIT products, is a few months away from completing its mission: To accelerate the adoption of robust, interoperable health information technology throughout the US healthcare system, by creating an efficient, credible, sustainable mechanism for the certification of health information technology products. Certification will ensure that a product has certain types of clinical prompts and decision support, privacy and security, and standards and interfaces to share information. Every doctor needs to ask their vendor if it is certified, and if not, when it intends to be. There are three ways we can help physicians: We want to help develop lower cost technology, improve the benefits or value of these systems, and lower the risk of adopting these products. The cost of support, training, integration, etc. is a fixed cost whether it is provided to five doctors or 50. Unfortunately, vendors cannot make this less expensive. We need to find simpler technology for small physician offices. Most products are built for large practices, which can absorb these costs; new products need to come to the market that will be less difficult to implement and maintain and for smaller practices, which typically lack IT departments. I anticipate that the time that this article comes out, our proposed regulation allowing hospitals to donate EHRs to physicians should be accepted. We are also pushing to see doctors get paid more for using EHRs through pay-for-performance initiatives. Certification will lower the risk of purchasing an EHR by allowing doctors to compare systems. For example, if two systems are both certified and one costs twice the amount of the other, doctors may select the lower cost option with the knowledge that it has met the standards required for certification. We see physicians as falling into three categories: Doctors who have already adopted EHRs – and don't want the government telling them that it is time to switch to a new product, doctors who will never adopt technology – and should have the privilege of that option, and those who fall in between. The end game is an effort to build a nationwide information network that will support all products. Much like a cell phone would be useless without Verizon or another telecommunications provider, the EHR is useless if it is not connected to laboratories and pharmacies. It should be plug and play. Then, it has huge value with a capacity to share information. Our vision is not to see a doctor use a product on a standalone basis. Yes, the EHR agenda has struck a chord and gained huge momentum. That is not to say that we do not have big challenges. The Centers for Medicaid and Medicare Services has to modernize its practices, for example. But the world is changing quickly and doctors are adopting these tools on a widespread basis. WHAT FUNCTIONALITIES SHOULD PHYSICIANS SEEK IN THEIR EHR PRODUCTS? We recognize that each specialty has its own requirements, either in terms of certain information that its physicians require or specific needs for documentation. So, we are asking each specialty society to provide additional criteria beyond what we establish for certification. They should ask vendors whether they can meet those specific needs and get together with other specialties and compare notes. SHOULD PHYSICIANS PURCHASE ELECTRONIC HEALTH RECORDS TODAY OR WAIT A WHILE UNTIL THE TECHNOLOGY IMPROVES? They should start now – unabashedly, yes. Although it is true that the software technology for EHR will likely change over time and continue to evolve, the concept that you can buy an EHR that you will use for the rest of your life is flawed. EHR usage is a journey, not a destination. The things that matter, that truly deliver value, are not inherent in the software, but rather, in the re-engineering and organization of a practice, and the changes a physician makes in order to implement an EHR. The group that has done the most is the American Academy of Family Physicians. The pediatricians have also done a great job in changing day-to-day practice through EHR. The American Academy of Neurology needs to see how it can help its members make better clinical decisions, share information, and ask how the practice of neurology changes if doctors were to have access to real-time information. 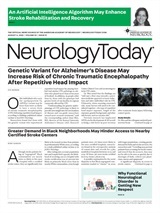 Neurology Today6:6-7, April 4, 2006.